You are here: Home / exercise / Don’t Ignore Pain in This Joint! According to the American Academy of Orthopedic Surgeons, knee joints are responsible for sending nearly 15 million Americans to the doctor every year. The knee is a complex system of ligaments, tendons, cartilage and muscle. The knee is prone to injury. It’s a complex hinge where the femur (thigh bone), tibia (shin bone), fibula (next to tibia) and kneecap all come together. Many exercisers just flat out push too hard (over-training syndrome), a physiological and psychological condition among athletes in which they exceed their ability to perform and recover from physical exertion (you know the type: weekend warrior in a 40-year-old body with a 21-year-old mind), often leading to injury or decreased performance. 1) You must lose the excess weight. 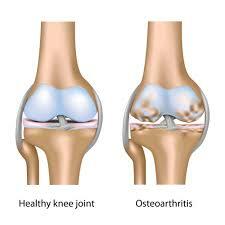 Being overweight causes extra stress on your joints, especially your knees. For every pound you lose, you remove 4 pounds of extra pressure off your knees, which ultimately reduces the extra wear and tear on your knees. So for every 10 pounds you lose, you reduce pain by 20%. 2) You must exercise and get blood circulating all over the body. This blood circulation keeps the cartilage well nourished. Now it goes without saying that you should avoid high impact (running and jumping) on your joints. Choose from walking and cycling or swimming. 3) Strengthen muscles around the joints…for example, your quadriceps and hamstrings need to be strong to keep your knee joints intact. Glucosamine Chondroitin can reduce inflammation and ultimately pain. Limit or entirely avoid the cortisone shots as much as possible, though. Why? 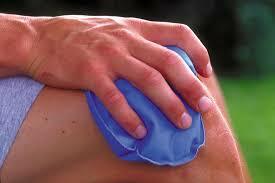 While cortisone may reduce the pain, cortisone shots can cause deterioration of cartilage in a joint. Don’t ignore knee pain. Find out what its source is and address the issue as early and thoroughly as possible. Women in particular have a 2x – 8x higher risk for ACL tears compared to men, mainly because the way women naturally jump, land and turn tends to put greater strain on the ACL. A sudden increase in intensity or duration of exercise can cause overuse injuries from repetitive strain causing Tendonitis, and kneecap pain are common symptoms in the knee. Be sure to include stretching exercises before and after working out, and after training make sure to give your knee joints plenty of time to recover. Filed Under: exercise Tagged With: ACL tears, arthritis, cartilage, Don’t ignore knee pain, Glucosamine Chondroitin, knee joints, ligaments, Orthopedic surgeon, osteoarthritis, tendonistis, tendons, What causes knee pain?